What Makes a Health and Beauty E-Commerce Site Work? Shopping for health and beauty supplies is generally a very hands-on and sensory process, thus understanding how the health and beauty E-commerce space operates is of especial interest in retail studies. We were recently inspired by a 2012 study from the A.T. Kearney Global Consumer Institute, which took a closer look at online consumer habits across the beauty and personal care industry. Based on previous research, we thought that the best health and beauty sites were the ones that made the shopping experience social, but the study suggested instead that consumers prioritize convenience and savings over all else. So we put this survey into practice. We picked several attributes that were considered most and least important to the online shopping experience, and looked at how they played out across a number of these online health and beauty destinations, from brand sites to Amazon.com. When we first looked at the health and beauty space online, we noticed that many brand sites are trying to outdo one another when it comes to social shopping. In-depth consumer reviews, Q&A forums, and links to social media help to turn the voices of fellow shoppers into an aggregate virtual consultant. Graphs regarding the most important attributes for beauty and personal care online shopping, and top online destinations for beauty and personal care shoppers from the A.T. Kearney study. But as the A.T. Kearney study found, peer reviews and online advising are actually considered some of the least important attributes of the shopping experience. Even video tutorials and usage guides, which do the best job replicating the physical demonstrations of an in-store consultation, are rated poorly in this study. We looked at how these factors play into the top online health and beauty destinations determined in this study. Brand sites were ranked a whopping fifth, falling behind Amazon.com, Sephora.com, a catch all “other” category, and even major drugstores and retailers. 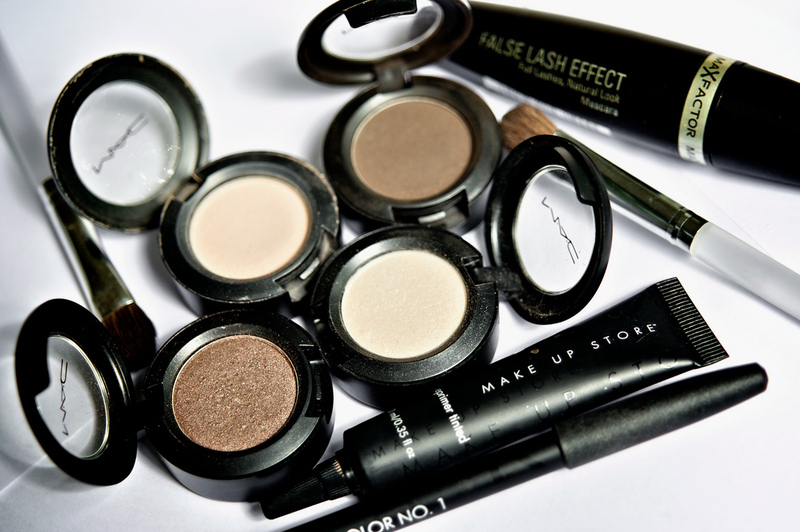 Though brands like Revlon and Origins have the most aesthetically pleasing sites of the bunch, save for perhaps Sephora, they also prioritize these lesser important attributes. Clearly, this illustrates that brand sites can’t rely on just these social shopping and product detail features alone to draw in traffic. But the results seem counterintuitive. If shopping for health and beauty supplies is such a hands-on experience, wouldn’t the aspects that contribute most to an in-store sell be more favorable? But a staggering 56% of shoppers are considered “creatures of habit,” folks who’ve figured out what they want and just need the fastest, cheapest alternative to get more of it. They aren’t going online to find tutorial videos or glowing reviews about a product; they just want to buy. Thus, finding specific products, free shipping and the best prices are among the top priorities of online health and beauty consumers. This illustrates quite clearly that convenience and savings are most important to these consumers, but there was less of a correlation here between favored shopping attributes and top consumer destinations. For example, Amazon doesn’t always have the best prices. 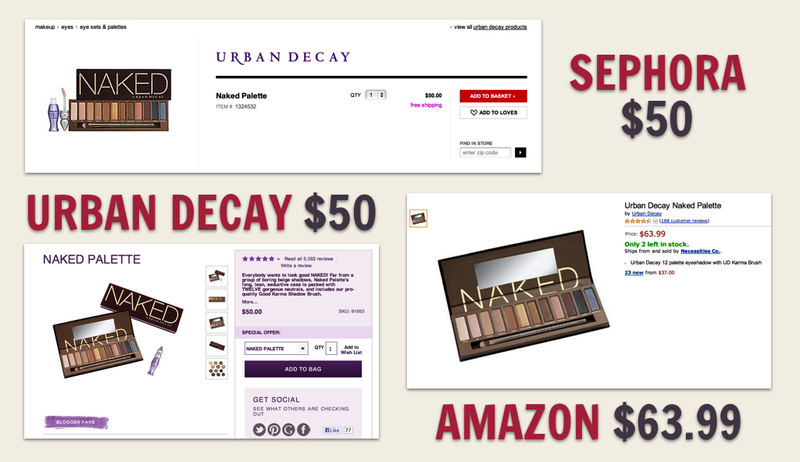 I looked up Urban Decay’s Naked eye shadow palette – a favorite among my peers – and found that I would have to pay a whopping $13 extra dollars on Amazon than I would on either Sephora.com or the Urban Decay brand website. All sites offered free shipping. Sephora and Urban Decay even offered free samples. You can’t actually buy an Infallible Le Rouge lipstick off the official L’Oreal Paris website (quite a disappointing inconvenience if you’re new to the site), but add the product to your shopping bag and it lists the going price at a number of retailers, including CVS.com, Walmart.com and Amazon. 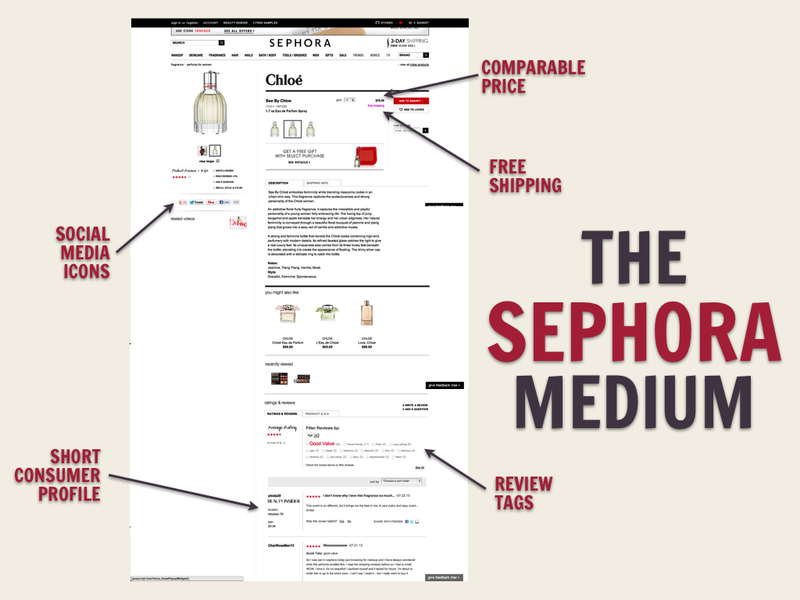 You have to then visit one of those sites yourself to purchase the lipstick, but the side-by-side price comparison still saves a step for new shoppers. So what does the perfect health and beauty site look like? Through analyzing different components of the A.T. Kearney study, it’s clear that there’s no one website that’s completely figured out the perfect online health and beauty shopping experience. Brand websites are spending too much time on attributes that too few consumers care about, but powerhouse E-commerce sites like Amazon can’t be relied on to constantly deliver the best prices. The closest compromise right now is probably a site like Sephora.com. An aggregator of some of the hottest brands in health and beauty today, there’s plenty of built-in social shopping features to discover and learn about new products within the site. But prices are also relatively consistent to the brand – as opposed to erratic Amazon and online drugstore pricing – and there are plenty of special offers, free shipping opportunities, and complimentary samples to go around.